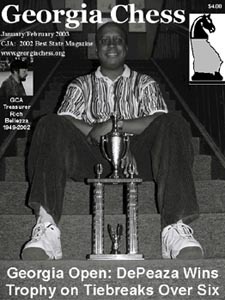 Terrence DePeaza is known in Georgia chess circles as someone who is consistent in his play and is not afraid to enter complications. Originally from Trinidad and Tobago, DePeaza is a product of the "Fischer Boom." He made National Master in the mid-80s and has scored well in past World Open tournaments including a 7-2 score in 1998. Last year, he won the Georgia Open (pictured right) and has increased his chess activity in the past year. In this encounter, DePeaza plays another immigrant by the name of NM Klaus Pohl, a tough German fighter who is a fixture in the southern U.S. tournament circuit. This game was unusually short and was highlighted by an opening error in the infamous Dragon. When a strong opponent makes a strange move, it is often difficult to distinguish between a novelty or an outright blunder. In this game, the brutal truth was revealed! Annotated by Terrence DePeaza with opening notes by Daaim Shabazz.